Whether watching your favorite sports team or lounging after a long day, this supportive chair features a soft cushion back and seat, allowing you to relax in comfort. 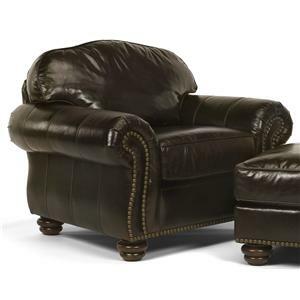 Enjoy Traditional accents such as rolled arms, turned feet and nail head trim accents along the front of chair arms. The perfect addition to your living room or den, the chair also comes in a wide variety of fabric and color options, allowing you to customize your look! The Bexley Traditional Style Chair with Nail Head Trim by Flexsteel is available in the area from furnishingretailers.com. Browse other items in the Bexley collection from furnishingretailers.com in the area.